UPDATED: MAY 3, 2018 Tin and a little lead like Belly. Golden pour. Cloying aftertaste. Bottle from a Colombian super market. UPDATED: FEB 1, 2018 Superficiale e poco spessa. Non ha carattere. Ma comunque piacevole accompagnata coi pasti. UPDATED: SEP 24, 2017 I thought this sucked. pours a pale yellow. quite bitter and medicinal. like it's trying to hide an issue with the beer. whatever..either way...it's not good. Very light clear yellow body white head nice lacing. Sweet bready aroma. Taste is faint sweet grains. Boring lager. I bought this can today at the denner in Gland. I drank it at the station with my wife after an activity with my daughter. The weather was perfect, so a beer sounds perfect, I saw this one that I never rated, without any hop of passion. The color is as usual gold, thin and white head, regular carbonation. The taste is like una pasta senza sal, boring but at least it is drinkable, some malt, a bit sweet some hop, watery, a bit metalic. 0.33l can from denner in basel, 0.45/0.90 fr. pours a clear pale golden with a dense white head and a nice lacing. aroma of hay, grass, a hint of citrus. flavour of cereals, grass, lemon zest. medium bitter finish. easily drinkable. Clear golden beer, standar carbonation, nice white head, the aroma doesn’t reveal anything in special, just some dough aromas. When is tasted the flavor is soft, with a light body and a watery sensation, the malt is not strong enough, and sadly the alcoholic level make it extremely sweet. In the aftertaste the hops are almost absent. On tap, 25cL. @Sedan, Le Bistro’ near the fortified castle. 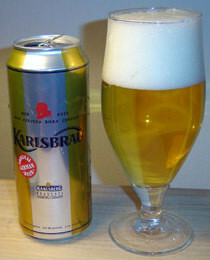 A bright pale yellow beer ; few bubbles ; medium white foamy head ; medium retention. Cereal, light herb, light lemon. Light sweet, light dry bitter refreshing. Light body, thin texture, average carbonation, herbal honey medium finish. Overall, ok lightly refreshing beer just before my meal.